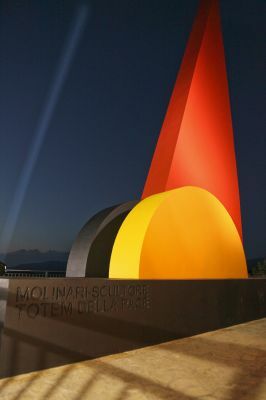 The Museum houses some Mario Molinari’s works, the” Sculptor of the color”, like the “Totem of Peace” and “Egyptian Portait”, in addition to picto-sculptures and other works. Furthermore, it’s possible take a tour of his “House-Museum” based in Turin. “What strikes me more about Mario Molinari’s sculptures is not the weirdness of his characters, not the intensity of their expressions, not the bewitched aura from they emerged to, not the singular, elegant and at the same time rough technique used to build his characters, but their frightening immobility. There were places and ages where artists praised their ability to express, or even reproduce, the movement, to take the distances from immobility. Those were periods of decline. But how Molinari got such a steadiness? This is a secret that is hard to communicate. Even when they gesticulate, walk, hunt or ride a bike, his “idols” stay crystallized forever. WATCH THE VIDEO "MOLINARI SCULPTOR OF THE COLOR"
WATCH THE VIDEO "THE LONG TRIP OF THE TOTEM OF PACE"